Objectives: This study aimed to evaluate nutrition care and nursing professional knowledge received by adults on highly active antiretroviral therapy attending primary health care (PHC) facilities. Subjects and setting: The study was conducted on 263 adults and 75 nursing professionals, recruited from 19 facilities in the Mbombela sub-district, Mpumalanga. Outcome measures: Interviewer-administered questionnaires were completed for each patient. Nursing professionals completed a self-administered questionnaire. Assessment tools were completed for each facility. Results: Some 41% of patients were either overweight or obese, and most females (n = 87; 51.8%) had a BMI ≥ 25 kg/m2. Based on waist circumference, 52.7% (n = 88) of females and 8.4% (n = 8) of males showed increased risk of cardiovascular disease. 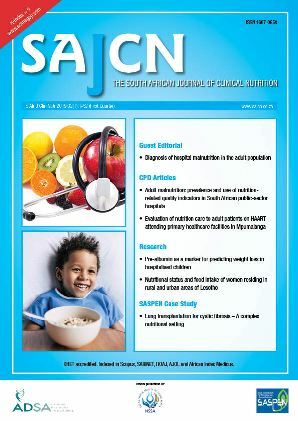 Although nurses were aware of a nutrition supplementation programme, knowledge of national nutrition guidelines was inadequate. Clinical judgement, rather than eligibility criteria, was used to identify suitable patients, with 13.3% (n = 35) receiving supplementation whereas only 4.9% (n = 13) qualified. Facilities generally had sufficient equipment and fair storage conditions, but stock shortages of nutrition supplements were problematic. Conclusions: Whilst certain positive findings emerged, nutrition care could be improved, largely through adequate training and support to professional nurses. Training should focus on correct execution of assessment measurements and appropriate nutritional counselling, emphasising balanced eating, food security and prevention of over-nutrition. Nurses should be familiarised with national nutrition guidelines and have access to a constant nutrition supplementation supply. Improved monitoring and evaluation of nutrition care to adults on treatment at PHC facilities is needed.